Poverty today is something like leprosy in the Middle Ages. Most of us are aware of it, but we’re uncertain how it is contracted, terrified to come in contact with it, and hope it stays quarantined geographically so that it doesn’t spread. For many, the concept of deprivation at any level causes them to lobby against “income inequality,” without acknowledging that the removal of natural incentives for productivity that enforcing income equality would need might well destroy the goods of society they wish were shared more equally. To many on the political and economic right, poverty is the divine punishment of losers and lazy people. To many on the left, it is the result of defenseless people being taken advantage of (consider that the most common epithet for those in poverty from the left is “the oppressed”). Both are, at various times. Both positions, when seen in the extreme, are also exceedingly condescending. Seeing poor as perpetrator and poor as victim both do a great deal to undermine the fundamental humanness of those in poverty. One reason why the poor are often dehumanized is that their voices are seldom heard. Unlike those of us with extra resources and time to host blogs, often the poor are more concerned with hustling to survive. When we hear from them, it is often after they have arisen from poverty. In those cases, they have often been assimilated into the political patterns of the right or the left. It is often hard to hear the real human stories of the poor, unless you are in regular contact with people in poverty. 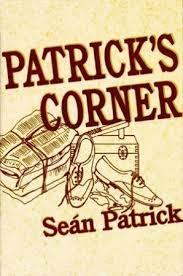 As a result, balanced memoirs like that of Sean Patrick are helpful. In his book, Patrick’s Corner, he documents the humanity of his large family in Cleveland. It’s the story of the survival and flourishing of six boys and their widowed mother in an ethnically Irish neighborhood. It’s a collection of tales that offer a vision into the real poverty of a real family. While it is certain we don’t get the full weight of the struggles of poverty in this memoir, the overall thread is realistic, hopeful, and compelling. Because the Patrick’s were limited in their travels, the cast of characters in this volume is rich. There are intergenerational connections that can only form through casual sidewalk contact over time. Poor men who invested a dime into the Patricks each week by getting a shoeshine they couldn’t entirely afford. Old men who needed a bit of help from time to time from the Patricks, but in return who gave them love and spiritual concern. This sort of community would be a miracle in our day. One of the significant themes in these stories is the goodness of work. The Patrick boys were all pressed into work of necessity, because of their economic station. However, that work was not pure drudgery. It was an opportunity for marketplace engagement with the surrounding world. It provided a chance for entrepreneurial growth and imagination. In short, the work the Patricks did enhanced their humanity, it did not detract from it, as some so often depict. From shoe shiner to newspaper boy to working in the poultry shop, the Patrick boys progressed through various jobs. These jobs were managed around their studies and their sports. It did not crush their childlike spirits or diminish the goodness of their waking hours. Unfortunately, so many of these opportunities have been legislated out of existence. For fear of bringing back the oppressive child labor of the early Industrial Revolution, we have largely made it illegal or financially impossible to allow kids to do the sorts of work they are able to meaningfully do. There are many fewer opportunities to be delivery boy or shop assistance because well-meaning laws have prevented the good in attempt to weed out the evil. It has made the path to adulthood much more difficult for children to follow. One thing is clear, though the author does not state it overtly, and that is the Patrick boy all benefited from the work they did. Not just financially, but also personally. This is not an academic treatise, but a book that tells stories about poverty, family, faith, and hope through all of the above. The stories are beautifully written, but more importantly, they expose a beauty of experience even amid the struggles of poverty. This book is valuable (certainly much more than its sales numbers likely allowed) because it humanizes poverty, showing that the best forms of poverty alleviation involve personal contact rather than simply writing a check.